Although Japan’s ceramic and lacquer ware history begins long before the Momoyama period, it is rare to find usable pieces for sale before the late 16th century. Before this, lacquer and wood were the materials of choice, as they were readily available and easy for common people to fashion into vessels. 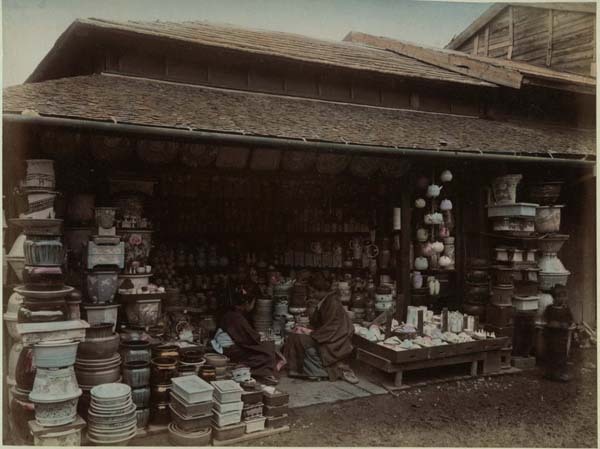 The Momoyama era also marked the end of a series of wars and famines, and little remains of common household goods. Toyotomi Hideyoshi was an important figure in Japanese history, and the short but artistically brilliant Momoyama (meaning peach mountain) era covers his reign, which was centered in Eastern Kyoto. Hideyoshi was from a humble background, and loved sumptuous gilded screens to brighten the interior of his castles and villas. But he was also a student of tea, and in his time, humble Korean bowls were extremely desirable. This led to “the pottery wars” named after the Korean potters Hideyoshi captured and brought to Japan during his failed attempts to conquer China. These potters were sent to different kuni (literally, countries, or former fiefdoms) and formed the base of many of the kilns and ceramic traditions that survive to this day. Although Hideyoshi was a fierce military ruler, he was but a student in the world of tea, and relied on his tea master Sen no Rikyu for counsel on aesthetic and cultural affairs. Rikyu’s wabi tea, a humble form of the formerly aristocratic pastime, gave birth to many of the defining concepts of Japanese art, and his influence is still felt to this day. With Korean potter Chojiro, he developed simple, wabi-sabi raku chawan (tea bowls) that transformed Japanese pottery. The esteemed Raku lineage are his descendants. Momoyama pottery is much sought after, and it is still possible to find pieces in good shape. Their rarity and wabi sabi aesthetic tend to bring high prices. Pieces from the Momoyama era typically exemplify tea ceremony ideals and often look much more modern than their age belies. Other notable potters (or taste makers) from this era are Furuta Oribe and Nonomura Ninsei. Hon’ami Koestu (1558-1637) was active in the late Momoyama to early Edo era. During the long, peaceful reign of the Tokugawa clan, Japan’s arts flourished, and it was possible to purchase a wide variety of ceramic and lacquer ware styles from different parts of Japan. Commerce flourished as merchants, samurai, tradesmen and artisans flocked to Edo (now Tokyo), creating demand. The resulting wealth created a large middle class who could afford quality ceramic ware. The Rimpa style is named after painter Ogata Korin, a great-grandnephew of Koetsu (see above), who was admired for the way he reduced natural forms into stylish design elements. His accessible, bold and decorative painted motifs were translated into pottery by his younger brother Ogata Kenzan, commonly revered as Japan’s greatest potter. Kenzan freely painted his brother’s motifs on casually shaped pottery, creating a new and uniquely Japanese vision now known as Kyo-yaki (Kyoto pottery). The Genroku era (1688-1703) was a particularly prosperous time during the Edo era, and patrons’ tastes changed with the times, calling for a more refined style of pottery. Delicate and skillfully painted porcelain ware, known commonly as Imari (which actually signifies export ware) were popular, and for the domestic market Nabeshima, Sometsuke, Kutani and Ko-kutani were widespread. As Japan opened its doors to the West, a flood of cheap Western imports arrived. Export Imari ware was also popular in the West, which was crazy for all things Japanese. This creative exchange of ideas led to a flowering of cross-cultural styles in architecture, painting and ceramics. Mass production and factory methods were introduced, and pottery from this era includes hand-formed as well as molded ware. Hand-painted porcelain was still produced, but cheaper ware could be produced by stenciling. The rush to modernization left many Japanese potters unable to cope with sagging demand, and some of them simply gave up to become farmers. Seeing the declining state of Japan’s native crafts, writer and scholar Yanagi Soetsu (1889-1961) started the Mingei, or folkcraft movement (mingei literally means “art of the people”). Together with potters Kawai Kanjiro and Hamada Shoji, Soetsu helped the public appreciate local artisans and potters and championed the unknown craftsmen. This movement was influenced by the Arts and Crafts movement in the West, which had similar ideals. The Taisho era also gave rise to stylized Art Deco designs and exciting bold motifs in ceramics.